On 9th December 2016 Inminds human rights group will hold a vigil outside the British Foreign Office to demand that the British government act to free British citizen Fayez Sharary who according to the Israeli judge's own admission has been tortured and should be released. The judges ruling was quickly overturned by the military court and Fayez Sharary remains caged, now for nearly 3 months. Fayez Sharary's wife Laila Sharary will address the vigil. Fayez Sharary's military court hearing is next week on 14th December, its imperative that representatives from the British government attend the hearing. The United Nations Office for the Coordination of Humanitarian Affairs has described the farcical court proceedings "as if the courtroom were a fully-automated conveyor belt" observing that "every file [case] got a minute to a minute and a half of discussion". 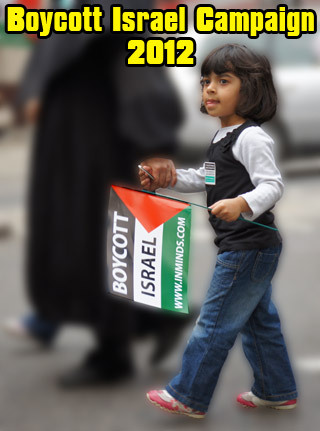 The protest will also highlight the role HP plays in Israel's torture and caging of Palestinians. Inminds chair Abbas Ali said "Its shocking that the British government is silent about the plight of a British citizen who has been abducted by a foreign power who admits that they have tortured him and that he has no case to answer. The British government has shamefully left Fayez Sharary to rot in an Israeli dungeon. Why is the government doing nothing to secure his release? We demand that the British government put pressure on the Israeli regime to immediately and unconditionally release Fayez Sharary so he can be reunited with his family." 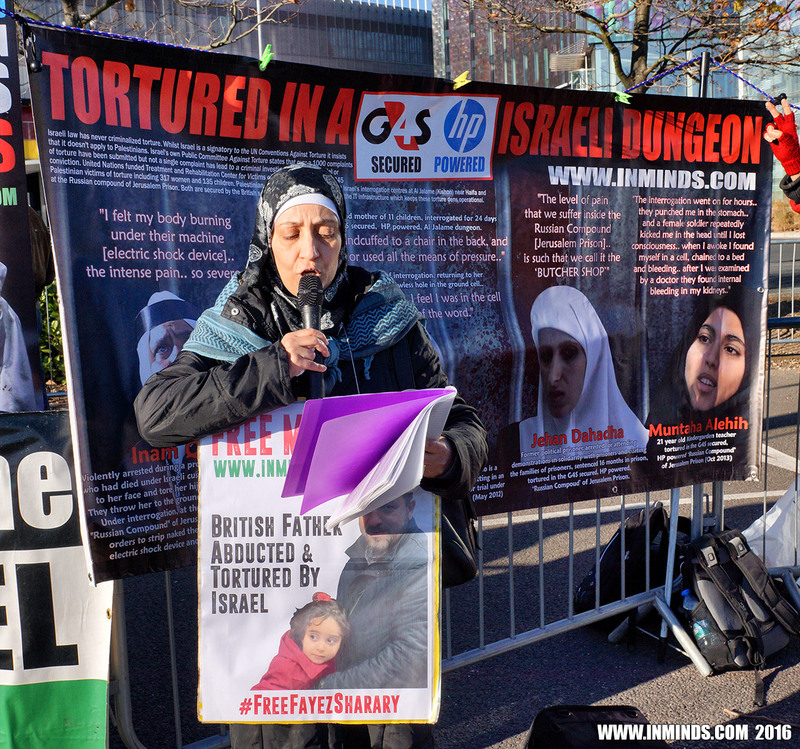 Regarding HP, Inminds chair Abbas Ali said "Its unacceptable that just one street away, here in London, HP is selling its printers and laptops; and in Palestine the same company, HP, is assisting in the torture of a Londoner. When Londoners are made aware of HPs dirty secrets they will rightly reject this company." Please join us on 9th December on Whitehall, outside the Foreign Office at 2:30pm. Father of five children, Fayez Sharary is a British citizen from the Palestinian diaspora who has lived in the UK for over 23 years. In September 2016 he travelled to the West Bank with his wife Laila and their youngest daughter Aya, just 3 years old, to visit their families and spend the Muslim holiday of Eid Al-Adha with Laila's mother who had recently been widowed. Fayez yearned for the opportunity to offer the Eid prayers at the sacred Al-Aqsa Mosque in Jerusalem. After the holiday Fayez Sharary and his family were returning home when on 15th September 2016, they were stopped by Israeli forces at the Allenby Bridge border crossing between the West Bank and Jordan. They were meant to fly back to the UK from Jordan on 17th September. The family were taken at gunpoint from Allenby Bridge and made to walk 5-10 minutes to an interrogation building. Israeli forces interrogated Fayez for 5 hours with his wife and daughter kept just outside the interrogation room in the corridor. No food or water was provided to the family for the 5 hours. When 3 years old Aya needed to use the toilet they refused her at first, and then said they will allow her if her mother Laila first submits to a strip search. After the degrading strip search they still refused Aya the use of a toilet. Instead they brought a plastic tray which is used for passing luggage through the x-ray machine, and told her to do it in there. After the five hours they took Laila's mobile phone and said she and her daughter could go but that they will be detaining Fayez. When she insisted that she will not go without her husband the soldiers got very abusive with her, screaming at her. On 26th October Fayez appeared in military court. In a highly unusual move, for the very first time an Israeli judge, Judge Lt.-Col. Azriel Levi, ordered the release of Fayed Sharary, saying that "There's no doubt that the defendant's confession, which was given an hour after the end of his Shin Bet interrogation, was dramatically influenced by the method of interrogation, which also included pained and prolonged shackling, threats, and a blatant exploitation of the defendant's demonstrated weakness." Keeping prisoners shackled in back breaking stress positions for hours on end is standard practice in Shin Bet interrogations. He pointed out that "Shin Bet’s own record of the interrogations included multiple statements by Sharary that he was downcast and ready to admit to whatever they asked him to admit to". In light of the torture, Judge Azrieli said his confession was “not given voluntarily” and its “value was zero.” The Judge added that several of the crimes attributed to Sharary did not even fit the definitions of crimes under the IDF’s West Bank laws. Despite the judge’s ruling Fayez Sharary was never released and a few days later at a hearing on 6th November the military overturned the judge’s decision to release Fayez Sharary on bail. Fayez Sharary and his family are all British citizens, yet the British embassy has done nothing to secure his release. Admission on record by an Israeli judge that a British national has been tortured in Israel should have raised alarm bells in the foreign office. Yet no action has followed. Not even one representative of the British embassy has attended any of the hearings. 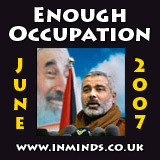 Without their presence the judge’s ruling to release Fayez Sharary was overturned with impunity. Fayez Sharary's next military court hearing is on 14th December 2016.